Laura Holmes-Haddad is a mother, food-and-wine writer, and (full disclosure) spouse of one of Kiosk’s founding partners. When she received a Stage IV inflammatory breast cancer diagnosis, the news struck her friends and family hard, including concerned colleagues at Kiosk. The good news? Laura now wears the designation “cancer survivor” with pride, and is in remission. Armed with hard-earned knowledge of the cancer patient journey, she has written This is Cancer: Everything You Need to Know, from the Waiting Room to the Bedroom, set for publication on October 18th, via Seal Press. Described as a “what to expect when you’re expecting” type guide for those living with a cancer diagnosis, the book is packed with practical advice and patient advocacy. 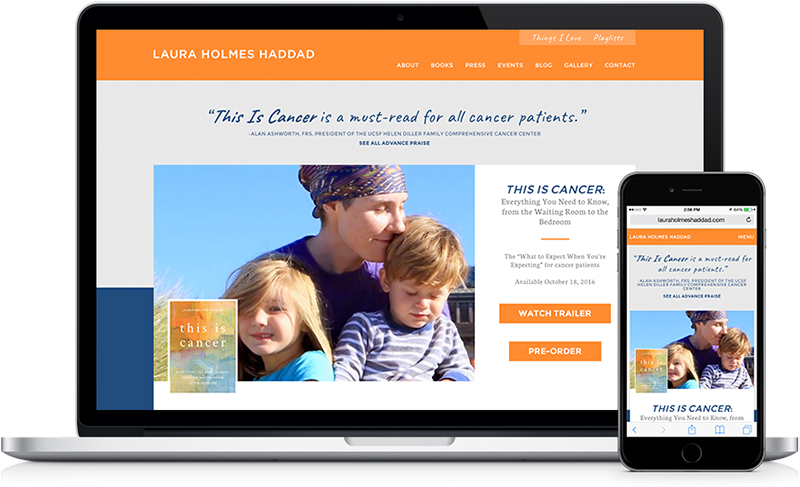 Kiosk was proud to collaborate with Laura, by creating her author website. Having shared some of her journey with her, we were honored to be able to help her bring her stories, experiences and vibrant personality online. If you’re looking to tell your story online, we’d love to collaborate with you.